Either way, they both stem from the same place: Fear. Fear and a basic misunderstanding of what the Bible does and does not have to say about education. The fact is, the Bible has lots to say about how we should conduct ourselves our Christians, lots to say about how we treat others….. and not so much to say about how we learn the three R’s. He was not a formal teacher. In fact, one of his favorite ways of teaching was simply through parables. He was the ultimate storyteller! And whether he was talking about the prodigal son, the good Samaritan, or the lost sheep, those fortunate enough to hear his stories learned real lessons. Important lessons. The kind of lessons that you don’t memorize for a test, but rather the kind of lessons that you turn around and live. He lived, and taught, with spontaneity. He was always in the present moment, always delivering what it was the people needed, right when they needed it. When the adulterer was about to be stoned (John 8) he patiently explained that “he who was without sin should cast the first stone.” When Martha and Mary had him over for dinner (Luke 10), Mary sat herself at his feet to listen. Martha busied herself with preparations, and complained when Mary did not do the same. Jesus took the opportunity to let it be a lesson in priorities: living and learning in the moment, instead of getting lost in life’s distractions. When he was traveling and came across the woman at the well (John 4) he not only showed her love and acceptance, but he broke three Jewish customs – speaking to a woman, speaking to a Samaritan, and drinking from her “unclean” cup – to do so. He taught by example. Jesus lived the way he wanted us to live. He modeled kindness, empathy, grace, and discipleship. He showed us what was important. Period. And as any unschooler – or parent – can tell you, the things that our children really learn, the things that are indelibly marked on their soul (for better or worse) are not the things that we have “taught” them, but the things that we have shown them through our actions, the things that they have learned through watching. Through listening. Through observing us as their parents… the people that they love and trust the most. 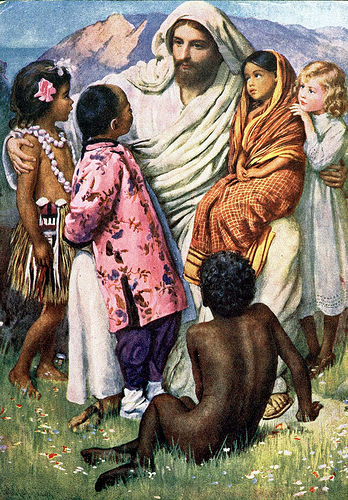 He said, “Let the little children come to me.” (Luke 18) This was no small thing. Parents were wanting to bring their babies and children to Jesus, and his disciples were trying to stop them, telling them to stay away. And Jesus said, “Hey, guys, it’s okay! Let them come! I want them to come!” He sat on the ground, and he welcomed them. Every one of them. Not only that, but he told his people they should humble themselves like those little children. He told his people they should become like those little children. He loved children so much, exactly as they were. And he didn’t gather all those children on his lap to teach them the finer points of carpentry. No. He gathered them to bless them, to listen to them, to love them. He respected children. He honored children….. something that is at the very core of unschooling. He hung out. A lot. And he wasn’t hanging out with the popular crowd either. Or the cool crowd. Or the affluent crowd. He was hanging out with the people that no one else wanted to hang out with. He was hanging out with the poor, the outcasts, the lonely, the adulterers, the prostitutes, the tax collectors. In other words, he was out there living life. He was living with, learning with, and learning from the people. He was befriending them. He was loving them. He was teaching them. All while he just… hung out. There are so many details about Jesus’s life that we will never know, this much is true. But the part that we do know? The part where he welcomed the children, where he traveled and lived and taught through life and love and spontaneity? The part where he hung out and visited friends and told stories and reminded people what was important? That part sounds an awful lot like unschooling.